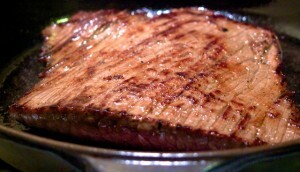 Liquid Gold week continues with an über simple beef recipe. I picked beef because upon reviewing the stats for MTK, it’s pretty clear that you prefer chocolate, bacon, beef and baked goodies nearly 2 to 1 over any seafood recipe I’ve posted! Oh, you don’t know what you’re missing – Cioppino Angel Hair Pasta is killer! So, though I do have a FABULOUS mussels recipe–with bacon(! 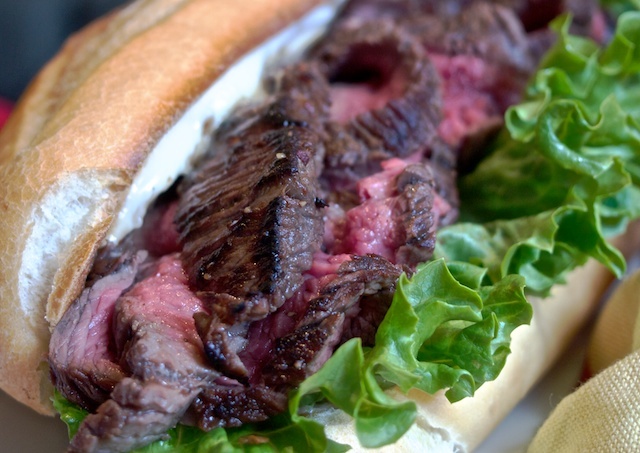 )– waiting in the wings, I defer to your tastes and give you a foolproof Spicy Flank Steak Po’ Boy. I grew up on a beef farm in Ohio, so I know cows. Boy, do I know cows. Mix the marinade in a gallon sized zip top bag. Add the steak and reseal. Put in in the fridge and let it marinate for at LEAST one hour, ideally four hours, or even all day (or overnight). When you are ready to cook the steak, remove it from the marinade and pat it very dry with a paper towel (discard the marinade). Heat a cast iron skillet or other heavy skillet or grill pan over high heat until it is very hot (don’t use non-stick for this because it isn’t considered safe to heat an empty non-stick to these temperatures, AND it won’t sear the meat sell anyway). Brush or rub the steak with Rosemary Garlic Olive Oil to coat, and season both sides VERY liberally with coarse salt (about a 1/2 tsp per side) and freshly ground black pepper. Don't move it until you flip it! 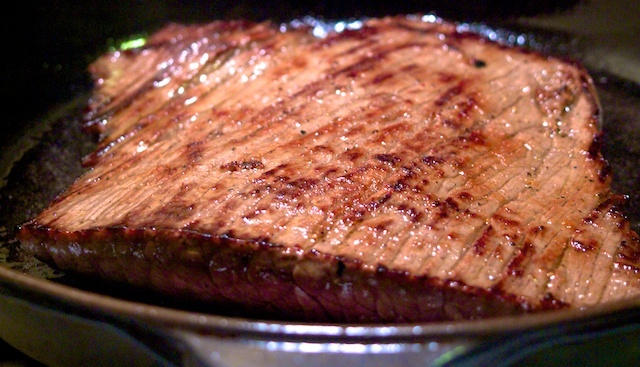 When the pan is very hot, put the steak in and let it sear on the first side for 2 minutes a side per half inch of thickness for medium rare (a half inch thick steak would get just 2 – 2.5 minutes; a incher would get 4 minutes.) Add 30 seconds to a minute per side for medium or medium-well, but if you like your steak cooked well done, this is not the cut of steak for you–flank steak will toughen considerably if allowed to cook through and it won’t matter how thin you slice it, it’ll still be a rough chew. Yeah – you can cook this on a real grill, too. Heat it until the grates are very hot, use paper towels and grill tongs to oil the grates with canola oil, prepare the marinated steaks as above with Rosemary Garlic Olive Oil, salt and pepper, and grill to medium-rare. Slice the bread long-ways for sandwiches and cut into individual sandwich sized lengths. Brush the cut side with the Rosemary Garlic Olive Oil , sprinkle with kosher salt and grill cut side down, or broil cut side up, just until it’s toasted (this is what toaster ovens were meant for!). While you wait, mix the mayo and mustard for a creamy dijonnaise. Spread the dijonnaise on both halves of the bread and layer on the lettuce and tomato. Sliced as thin as you dare... the thinner, the better! Now it’s time to cut the steak. 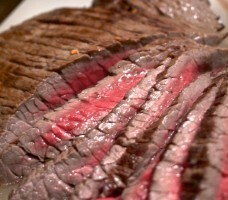 First, notice that this steak has long muscle fibers running the length of the steak. You want to cut perpendicular to these fibers (across the grain, as it were) as thinly as you can (you’re keeping your knives sharp, right). Pile on the beef and you’ve got yourself a Po’ Boy. Enjoy with a sensible salad or french fries – be as healthy as you want – but for God’s sake, finish that red wine you opened to make the marinade. I mean, you only used a flippin’ quarter cup, for pity’s sake!